When looking at fitness ideas for the whole family, it can be difficult to come up with fitness ideas for older family members. Often people can worry about how to include young children in their family fitness plans but in actual fact, children tend to be very adaptable and open to new things; therefore they are more likely to be able to join in with new sports and activities. Older family members may be more set in their ways and less likely to want to start playing a new sport. In addition, they may well be less mobile and less fit and therefore it can be difficult to find a sport which still appeals to younger family members while being something which older ones can take part in as well. The first option is to look at gentle sports which will not put off the less mobile and older members of your family. The first obvious place to look is at walking. 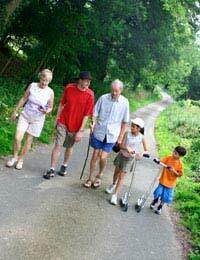 Walking is something which is the ideal family occupation as it can be done anywhere and anytime. In addition, family members can enjoy each other’s company as they walk along rather than being out of breath and not able to speak to each other. However, the disadvantage is that younger members of the family may not find it too interesting and their attention may soon wane. There are other activities which may appeal more to youngsters but which can also be done at a more gentle pace to suit older members of the family, such as cycling. If you take up cycling as a family, then the more energetic members of your family can then also go off on faster and harder rides while you can still enjoy more sedate exercise on more gentle rides. Racquet sports appeal particularly to older people as they can be very fast-paced and energetic without requiring participants to run around too much. In particular badminton and squash fit this bill. This makes them the ideal sport for families to take up together. The more energetic members of the family will enjoy the speed and energy of these games while older and less fit members of the family will benefit from the lack of running required. But everyone will still be able to improve their fitness through the sport itself and will also benefit from a good dose of healthy competition. There are, of course, other sports which older people who are not as fit as they once were, can take part in. Swimming is a particularly good example. However, the problem with sports such as swimming is that they are not particularly sociable and so do not lend themselves to being a sport which families can enjoy altogether. Having said that, if the age range of the family is very wide, such as with grandparents and grandchildren, then swimming could provide a great opportunity for them to take part in a sport together – with the grandparents even teaching the grandchildren to swim. It should be clear that there are plenty of sports and types of exercise for everyone. Regardless of their age or fitness ability, and with a little foresight, it is also easy to find something which suits everyone in the family.